Tedesco and his team calculate the duration and extent of melt over the ice sheet, using satellite data to develop a ‘cumulative melting index’. The index is defined as the number of days when melting occurs multiplied by the total area subject to melting, and is a measure of how much melting has occurred in a season that normally runs from June to September. 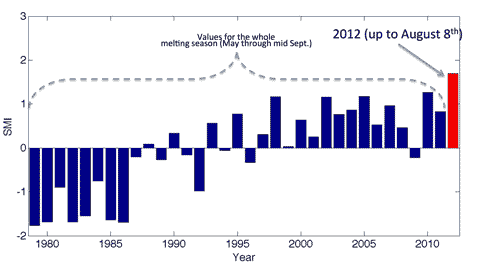 As the chart below demonstrates, by August 8th the melt was already well ahead of 2010. So far this year Greenland has experienced extreme melt in virtually every corner of the ice sheet, and especially at high altitudes. 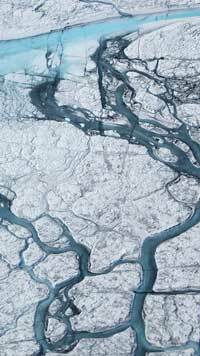 When summer’s over, and the research teams ponder the data they’ve gathered on the ice, it seems pretty clear that there are going to be some interesting figures to consider, with consequences for everyone with beachfront property… Follow Tedesco’s work, and that of other teams working on Greenland on his Greenland Melting site.